JOHOR BARU: SP Setia Bhd is eyeing more land in the Johor Baru district for future development projects in view of the good long-term business prospect, said president and chief executive officer Tan Sri Liew Kee Sin. To date, the company has 607ha left for development from four projects in Johor Baru, namely Bukit Indah and Setia Eco Gardens in the Nusajaya Corridor, Setia Indah in the Tebrau Growth Corridor and Setia Tropika in Kempas, according to Liew. 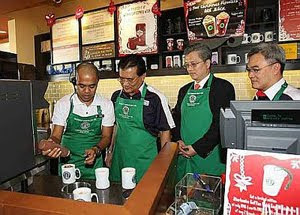 A Starbucks employee (left) showing Tan Sri Liew Kee Sin (right), Mohd Jaafar Awang (second from left) and Berjaya Starbucks Coffee Co Sdn Bhd executive director Datuk Francis Lee how he makes coffee at the opening of the drive-thru outlet at Setia Tropika. “The remaining land here will keep us busy for the next three to five years and we are looking to add 607ha for future projects,’’ he said yesterday. Liew said Johor’s contribution to SP Setia’s earnings was significant and for the financial year ended Oct 31, RM500mil of its RM1.6bil turnover came from Johor. He was speaking at the official opening of the drive-thru Maybank and Starbucks Coffee outlet as well as the KFC and Pizza Hut outlets at Setia Tropika’s central business district (CBD) by Johor Baru Datuk Bandar Mohd Jaafar Awang. Maybank offers the first-drive thru banking services in Johor and the second private banking here after its outfit at the Johor Baru City Square Office Tower and is connected to Malaysia’s first Starbucks drive-thru. Liew said a three-star hotel by a local operator and serviced apartment blocks would be coming up in Setia Tropika’s CBD next year, occupying 0.40ha and 1.21ha respectively. “We are going to sign the agreements with the respective parties in the first quarter of 2010 but at this point, I cannot give more details on the two projects,’’ he said. Liew said the company did not plan to build a stand-alone shopping centre in any of its ongoing projects in Johor Baru as there were already too many shopping centres here. He said it would instead focus on the niche markets such as drive-thru outlets, hotels and serviced apartments as demand for such products and services in Johor Baru was not fully tapped. Liew said that for instance, Johor Baru could offer good hotel accommodation alternative for those attending seminars, conferences or business meetings in Singapore as the rates here were much lower. He said the company would also be looking at Sabah and Sarawak and the contract to build a state-of-the-art transportation hub Aeropod @ Tanjung Aru in Kota Kinabalu would be a starting point. KUALA LUMPUR: SP SETIA BHD net profit for the fourth quarter ended Oct 31, 2009 fell 25% to RM56.86 million from RM76.08 million a year ago, mainly due to the inclusion of profit recognised on the disposal of its 25.07% interest held in Loh & Loh Corporation Bhd amounting to RM26.9 million a year ago. However, the effect was partially mitigated by the recognition of profits on the disposal of land to Greenhill Resources Sdn Bhd in the current quarter of this financial year, the company said on Thursday, Dec 10. It proposed dividend of nine sen per share. For the full-year, net profit was RM171.23 million compared to RM213.46 million, while revenue declined to RM1.41 billion from RM1.47 billion. S P Setia’s profit and revenue were mainly derived from its property development activities carried out in the Klang Valley, Johor Bahru and Penang. Ongoing projects that contributed to the group’s profit and revenue include Setia Alam and Setia Eco-Park at Shah Alam, SetiaHills at Bukit Indah Ampang, Setia Walk at Pusat Bandar Puchong, Bukit Indah, Setia Indah, Setia Tropika and Setia Eco Gardens in Johor Bahru and Setia Pearl Island in Penang, it said. Reviewing its performance, SP Setia said that in FY2009 it set a new benchmark in terms of total sales of RM1.65 billion, or an 18% improvement from its previous record-high achieved in FY2008 and 50% higher than its FY2009 sales target of RM1.1 billion. Of the total, Malaysian projects accounted for RM1.58 billion whilst EcoLakes, the group’s maiden project in Vietnam, achieved a commendable US$21 million or RM71 million from the launch of its first two phases, it said. SP Setia said the strength of its sales was a strong testament not only of the resilience of the regional property market particularly that of Malaysia but also of the inherent attractiveness and desirability of its products – twin conditions necessary to excel in challenging times. Macroeconomic conditions in the region are expected to further improve in FY2010, which will enable the group to reap the benefits of the long-term seeds of growth planted in FY2009, it said. “These include the strategic decision made to proceed with the launch of Setia Sky Residences, Setia Walk and EcoLakes, projects that represent the group’s maiden expansion into the luxury high-rise, integrated commercial and international spheres respectively. “The strong take up rates of 80% top 90% achieved by all three projects in these new markets are early firstfruits of the group’s bold implementation of its growth plans amid the turbulence of FY2009,” it said. The company said that for FY2010, its management intends to focus on improving overall yields by targeting to grow either the gross development value and/or margins on PROPERTIES  sold through continued value creation on all its development projects. Other plans include the proposed disposal of certain non-core assets and deployment of its strong balance sheet to acquire new landbank to secure long-term growth prospects. “While near-term profit margins will continue to remain range-bound next year due to the flow-through effect of the 5/95 financial incentives given and the attractive introductory prices in 2009 for new project launches, the group is still expected to see a return to earnings growth in 2010. “As such, based on the strong sales achieved in FY2009, management’s plans for FY2010 and on the assumption that macroeconomic factors remain conducive, the consensus earnings growth of between 10% and 15% estimated by investment analysts is in-line with internal management targets,” it said. 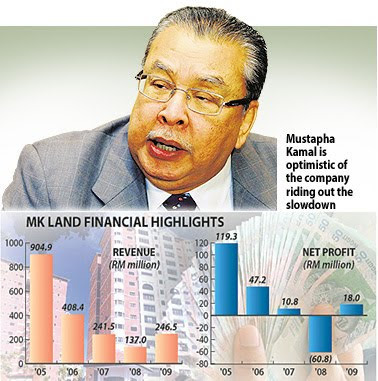 Property developer MK Land Holdings Bhd projects profits to grow in double digits for the next five years as it launches more projects. The company fell into the red in fiscal year 2008, recording a net loss of RM60.8 million. However, it returned to profitability in the financial year ended June 30 2009, posting a net profit of RM18.3 million. MK Land's redesignated executive chairman, Tan Sri Mustapha Kamal Abu Bakar, said the growth projection was based on its renewed business strategy of focusing on saleable products such as affordable homes with high profit margins. "The group now has a roadmap whereby all MK Land 'citizens' will concentrate on selling a basket of products, which include residential, commercial and office buildings. "For example, we plan to launch 40,000 low-cost houses which can bring us high profit margins. We have the same people, landbank and products to achieve the growth," he told reporters after the group's annual general meeting in Petaling Jaya yesterday. Mustapha Kamal, through the privately-held Emkay group of companies, owns 47 per cent of MK Land. About one and a half years ago, Mustapha Kamal relinquished his executive position in MK Land to focus on the Emkay group. However, he assumed the chief executive post in June this year to help MK Land regain its footing. "We have managed to register average monthly sales of RM11.3 million for the past one year, compared with RM7.6 million in 2008 which had contributed to the loss. "Hopefully, the average monthly sales can climb to RM51.3 million in the coming months," he said. MK Land's five-year sales drive will cover 30 per cent of its landbank of 3,239ha nationwide. Mustapha Kamal said that global recession notwithstanding, the company expects the domestic property market to recover. MK Land is confident of riding out the slowdown through strategies like targeting landed property products at niche markets, he added. Property developer MK Land Holdings Bhd will launch the first phase of its RM3 billion affordable housing project in northern Bangalore, India, by June next year, three months later than initially planned. Its redesignated executive chairman, Tan Sri Mustapha Kamal Abu Bakar, said that building plans were awaiting the approval of authorities in the state of Karnataka. "Under Phase 1, we will build 4,500 affordable homes which are a replica of MK Land's house design in Malaysia," Mustapha Kamal told reporters after the group's annual general meeting in Petaling Jaya yesterday. MK Land is partnering two other companies in the project: Embassy Group of India and MKN Embassy Development Sdn Bhd. MKN is a joint-venture company set up by MK Land and Embassy Group to develop information technology parks, particularly in Cyberjaya, Selangor. It will be the group's first project in India and second overseas, after Namibia. The development will encompass 120ha near the new Bangalore International Airport. The project will be undertaken in four phases and developed within five years. It will potentially deliver 16,000 affordable houses, ranging from 650 sq ft to 1,200 sq ft, and about 560 retail outlets. The houses, priced from RM100,000 to RM130,000 each, are targeted at the low-middle-income group. Bangalore, India's Silicon City and Karnataka's capital, is home to well-known information and communications technology companies, related colleges and research institutions. Mustapha Kamal said the group had received more than 600,000 applications to buy the Bangalore houses. The city has a pent-up demand for more than six million houses.